At the World Trade Center site in Lower Manhattan, 2,753 people were killed when hijacked American Airlines Flight 11 and United Airlines Flight 175 were intentionally crashed in the north and south towers. Of those who perished during the initial attacks and the subsequent collapses of the towers, 343 were New York City firefighters, another 23 were New York City police officers and 37 others were officers at the Port Authority. . .
Near Shanksville, Pennsylvania, 40 passengers and crew members aboard United Airlines Flight 93 died when the plane crashed into a field. It is believed that the hijackers crashed the plane in that location, rather than their unknown target, after the passengers and crew attempted to retake control of the flight deck. Families and friends continue to suffer. Survivors suffer from trauma, cancer, and other diseases stemming from these tragedies. Many are unable to work or to lead normal lives. It is a day we remember. But do we? As history repeats itself, we do not learn. Syrians are suffering and much of the world is closing its eyes and its doors. The world continues to fight over religion, land, money . . . countless innocent victims are left homeless, without money, without clothing, without food . . . and often without their lives. 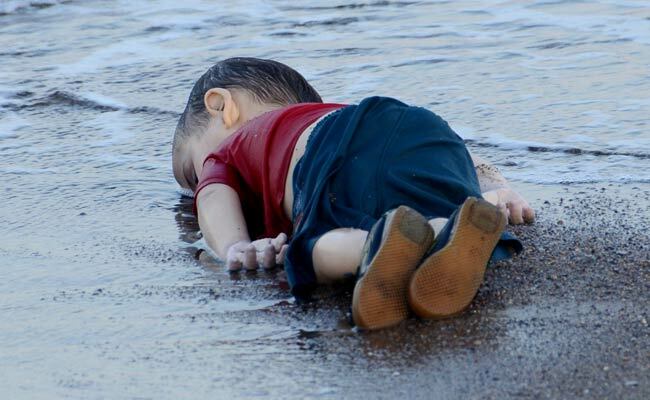 This is Aylan Kurdi, a 3-year-old boy who drowned along with his brother and mother, fleeing war-torn Syria, in an attempt to travel by an inflated boat from Turkey to Greece. The family was refused entrance to Canada. I am sickened by the response of so many countries. Yes, accepting these refugees into your countries will cause economic problems, at least for a while. Last week, the Hungarian Prime Minister, Viktor Orban, was quoted as saying, “refugees threaten Europe’s Christian roots.” That’s got to be one of the most non-Christian things I have read in a very long time. “Hungary’s right-wing government, which has been trying to stop the flood of migrants, has erected a barbed wire fence along its more than 160-kilometer (100-mile) border with Serbia to prevent them from crossing there. ” http://edition.cnn.com/2015/09/09/world/welcome-syrian-refugees-countries/. It is reported that Saudia Arabia, a Muslim neighbor or Syria, one of the largest and wealthiest countries in the world, has “100,000 Air conditioned tents that can house 3 million people sitting empty yet has taken ZERO refugees.” http://www.infowars.com/saudi-arabia-has-100000-empty-air-conditioned-tents-that-can-house-3-million-people-yet-has-taken-zero-refugees/. Ah yes, they are saving those for the Hajj pilgrims. Saudi Arabia have, however, pledged to build 200 mosques in Germany. While that is very nice for the Syrians, how will that help quell the ignorant fears of the so-called Christian countries? Wouldn’t it be better to take this one step at a time? Provide them first with the basics: homes, food, jobs! Start the next religious battle after they have what they need. 4.1 million Syrians have registered as refugees in various countries. The majority have landed in neighboring countries; Turkey, Iraq, Jordan, Lebanon and Egypt. Turkey alone is currently hosting more than 2 million Syrians and Iraqis. European countries have taken in much lower numbers, with promises of accepting more. The UK recently promised to take 7,000 over the next 5 years. Is that some kind of a joke? Where shall the Syrians go in the meantime? About 1,500 Syrian refugees have been admitted to the United States since the start of the conflict in 2011, the vast majority of them this fiscal year. . . About 300 more refugees are expected to be admitted by the end of this fiscal year. This equates to a grand total of about 1,800 refugees from Syria’s four-year civil war . . . President Barack Obama ordered his administration to “scale up” the number of Syrian refugees — at least 10,000 in the next fiscal year. . . The United States has given the largest share of aid to the Syrian refugee crisis, more than $574 million, or 31% of total aid donated, the United Nations said. According to the Toronto Sun, Canada has given permanent refugee status to 1300 refugees with a promise of 10,000 more over 3 years. Let’s step it up people! There is no easy solution to this battle. Everyone will continue to point fingers in blame instead of working together for a solution. The least we can do as “good Christians”, “good Muslims”, “good Jews”, and so on, is to open our hearts, open our pockets, and open our our doors. As I have said before, we are all living on borrowed land in borrowed time. To think otherwise is a bunch of poppycock. I pray. I pray for those suffering and dying. I pray for those leaders who don’t see the light. I pray that American “Christians” stop showing their ignorance by wasting their time fighting over such things as Gay marriage. I pray that Turks remember that all Kurds are not PKK. I pray that Israel and Jerusalem find a peaceful solutions soon; for those fleeing Eritrea, for the slaves of in Mauritania. There are so many people who truly need help in the world. It makes my personal problems seem overwhelmingly tiny. Today is the 514th day since 273 Nigerian high school girls were kidnapped by Boca Haram. http://bringbackourgirls.us/. I pray for them. I remember 9/11. Do you?